Reliable, but at the same time inexpensive roofing is a dream, perhaps, of every home owner. Such characteristics possesses shingles. In order to end up with a high-quality coating, we suggest you to get acquainted with the technology of its installation. 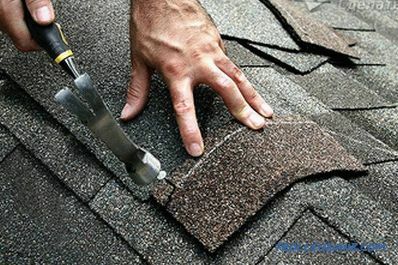 Doing installation of shingles with your own hands will save you a lot of money. High-quality styling - a pledge of durability of the coating. Installation steps consist of several stages. These include the installation of the base under the roof, then the lining layer is laid, eaves, endovy and end parts are installed, and the device of adjacencies is carried out. At the final stage, the installation of shingles on the ridge. In more detail all these points will be described in this article. Bituminous tile has a relatively small weight and is affordable. Due to the ease of tile, you will have the opportunity to make a lightweight version of the foundation. It will turn out not very massive house, and this in turn will allow you to save on building materials and payment for work. 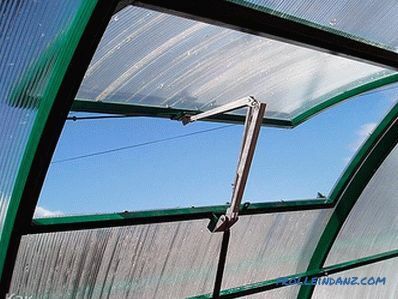 High heat resistance, frost resistance and resistance to strong wind. High tolerance to sudden changes in temperature. The color does not change over time. Before laying the tile, it is necessary to prepare the basis for it. It is placed on top of the frame, which is solid or lattice. As a rule, the basis for shingles is made of wood. The lattice frame is best made from planed coniferous boards of 20-25 mm. To make a solid basis will fit moisture-resistant chipboard or plywood, sheet and edged boards. They are attached to the rafters with screws / nails. Between the individual elements should be left a few millimeters in the process of flooring sheathing. This is due to the fact that when drying wood it will be necessary to compensate for its expansion. This moment can be missed only if the material was previously subjected to technical drying. In order to increase the service life of all wood elements, prior to installation, they should be soaked in an antiseptic. In order to install the roof as accurately as possible, it is necessary to pre-calculate the installation distance of the rafters and the thickness of the board used for the frame. For example, if the spacing of the installation is 60 cm, then you need to take a board having a thickness of 20 mm. Accordingly, if 90 cm, the thickness increases by 3 mm, etc. 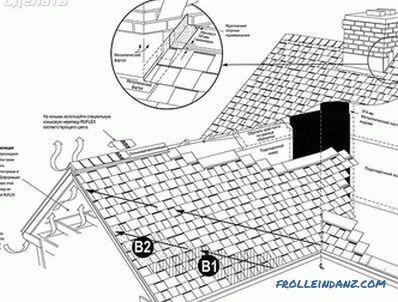 The ventilation of the soft-tile roof is usually equipped with a ridge. It fits on a ribbed profile. 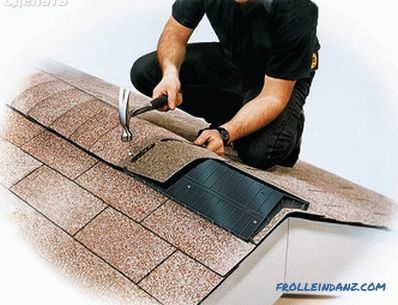 If the capacity of the ridge is not enough, you should install on the roof surface of the ventilation elements. This is a kind of profile with edges that are located at a distance of 2 cm from each other. The ventilation elements are fixed with nails to the base of the roof after fixing the tiles. Waterproofing is designed to protect the house when a tile is leaking. 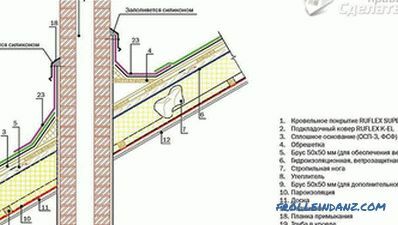 Provided that the slope is inclined at an angle of 18º and more, the insulating material should be located parallel to the eaves and the ends of the roof. Why? The fact is that in these places there is a high risk of leakage. In view of this, it is important to carry out the installation of waterproofing no less than 40 cm from the edge. 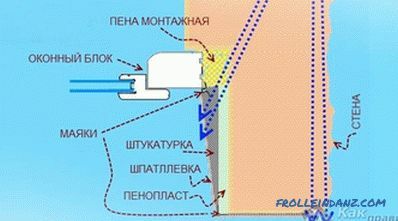 In addition, you should conduct waterproofing ridge. 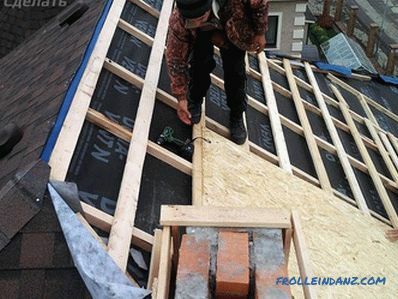 Installation of insulating material should be 25 cm on each side of the ridge. 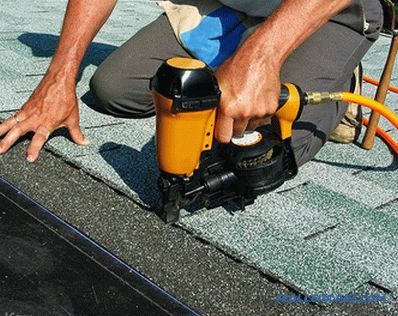 If the roof slope is 12-18º, then another lining layer should be laid over the entire surface. In this case, the work must start from the bottom up. The layers of the ring are overlapped. Waterproofing is fixed with nails, which should have a cap size larger than usual with a galvanized surface. The frequency of nailing - every 20 cm. To strengthen the edges of the roof, take the metal strips. They are stuffed on top of the lining layer on the eaves and ends. 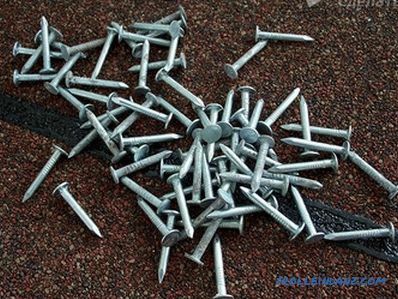 At the same time, roofing nails should be used (nail spacing 12 cm). Then the self-adhesive tile is laid. The protective film before gluing it must be removed. Then, glued to each other, it is glued along the eaves, and then fixed with nails. 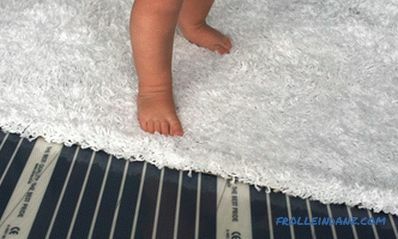 A carpet specially designed for this purpose is placed in the endova. It must be secured on both sides. Then you need to miss it on the edge of bitumen mastic. To make the installation of the top layer of bitumen tiles, you should use bitumen-polymer material. With it, it creates a continuous coating with high elasticity. It withstands mechanical and thermal deformations of the roof base.In accordance with the regulations, hot and cold mastics should be used for laying soft roofs. Cold mastics are used to process the inner layers of the roof. Their hot counterparts are used as an outer coating. Among the cold mastic is bitumen and roofing material, and the hot - toli and tar. The composition of the mastic should be powdered mixture. It may be ash, gypsum or lime. 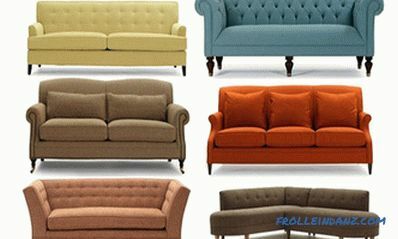 This material can be made on its own or purchase its ready-made counterpart. 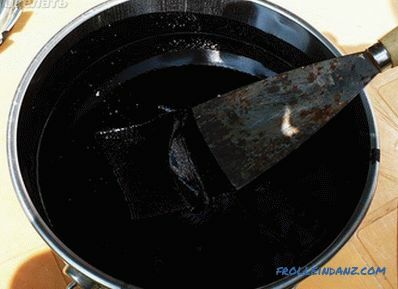 For making mastic you need bitumen and filler. In the percentage ratio of bitumen should be about 80%, and, accordingly, the filler - 20%. To get cold buteprol need 2 parts of bitumen to take 1 part diesel fuel. In this case, the bitumen is heated to 180º, while the filler and diesel fuel are settled elsewhere. After evaporation of water in the bitumen, both compounds are interconnected. 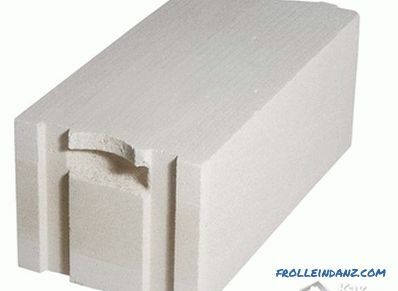 This instruction will help you to make cold mastic with your own hands. To make hot mastic, you need a hot plate. 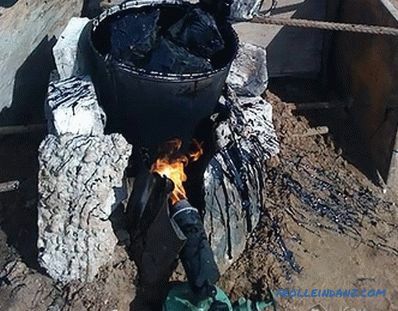 Bitumen needs to be brought to a temperature of 200º, slowly adding filler to it. It is important that the composition does not cool down more than 160º. To check the quality of the mastic, it should be laid at a 45º angle. To do this, it must be preheated to 60º. So, if the coating drains, then it is of poor quality. If it does not drain, then still need to let it dry. If the cracks do not show up, it means that you managed to make high-quality mastic. In order for the roof not to be differently colored, you need to use several packages of tiles at once. The color, of course, will not be the same, but at least it will be uniform. Work begins in the middle of the ramp. Tiled tiles should be laid in vertical rows. Move from the center to the front. It is important to monitor the gap, which should be 2-3 cm between the edge of the tile and the eaves tile. This point is important to align when laying the first row. For the formation of an attractive pattern, the last part of the second-row tile should be trimmed. This is usually done in the center. If necessary, the elements of shingles can be cut along the edge of the cornice. It is also important that these edges, prone to cutting, are subsequently treated with bituminous glue. Coat the strip with glue, about 100 mm wide. 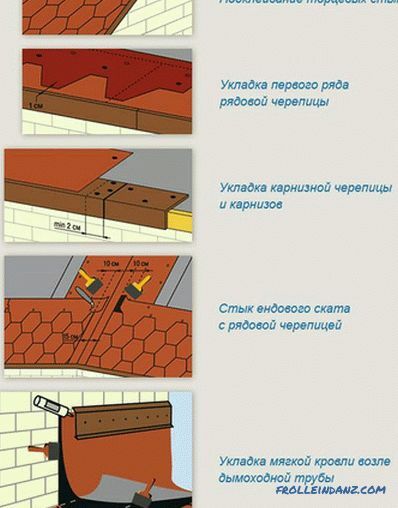 Alternative shoring should be provided for shingles. To crate it must be attached with nails. This is done when laying adjacent to each other rows. About five nails are nailed on one shingle. This is due to the fact that, over time, the bitumen tile adheres to the crate over time due to solar heat. The roof usually has connections with, for example, a furnace heating pipe. In this place there will be a gap, as a result of which moisture will penetrate inside the roof. In order to avoid this disadvantage, you should properly attach the shingles. First, drive the rail to the junction of the pipe and the roof. Then wind up the tiles on the rail and partially on the pipe. Next on it, starting with the pipe, you need to lay the valley of the valley so that it blocks the pipe 300 mm higher from the surface of the roof. At the end of the lower part of the pipe with a carpet and tiles covered with painted tin on all sides. In order to avoid snow accumulation behind the pipe during operation, it is necessary to install a chamfer. So, melting snow / rainwater, when hit by gutters, will flow around the pipe, flowing down the roof. 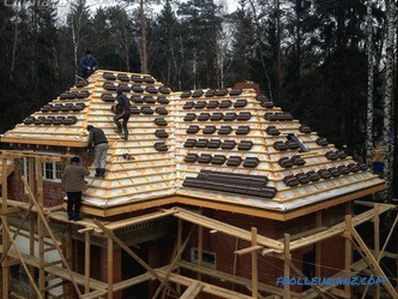 When installing the tile on the ridge, ridge tiles are required. It is made with perforation, dividing each element into 3 conditional parts. It should be laid overlap equal to 5-6 cm. This process should be performed so that the tiles are parallel to the ramp line. The short side of the tile is parallel to the ramp lines. It needs to be fixed with nails. 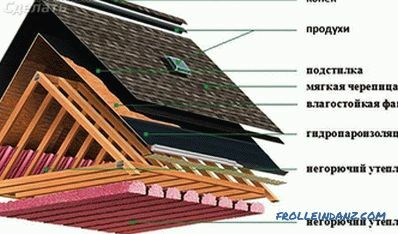 The roof of shingles can be laid only at a positive temperature when the thermometer shows not less than + 5ºС. This is due to the characteristics of the shingle (a sheet consisting of three to four tile elements). It is attached to the crate with nails or on a special self-adhesive layer. The fact is that the tightness of the soft roof is ensured by the heat of the sun. Under its influence, the sheets are glued together with the base and among themselves. In the cold, it will hardly be possible to achieve this, which means that the isolation will leave the best. On the skate it is necessary to do overlap, and in cold weather the shingle becomes especially fragile. 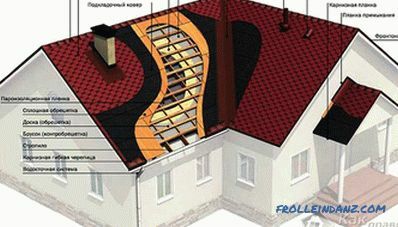 It also happens that the roof of flexible tiles is forced to be installed in winter. In such cases, the roofing material must be kept in a room with room temperature.If you still have questions on the topic, you can get additional advice from our specialist.